Available in various ratios ranging from 5/1 to 100/1. Foot mounted version shown - also available with output flanges & output shafts. Units are compatible with IEC motors. 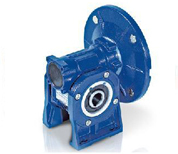 The Spaggari worm unit is also available as a speed reducer. Foot mounted version shown, but a flange mounted output is also available. 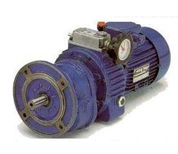 The Spaggari Gearboxes are compatible with IEC motors. The Spaggiari mechanical variation is a modular design with a speed variation range od 5/1. 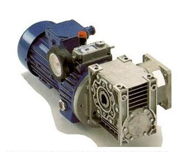 The Spaggiari variator can is compatible with an IEC input to suit a motor. 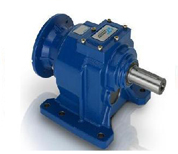 The variator output can be fitted with a gearbox on the output to obtain slower output speed variation. Please see pictures below for some options. 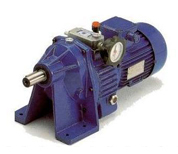 Spaggiari motor, variator & helical foot mounted inline combination unit shown above. 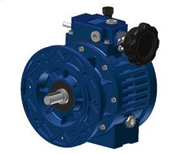 Spaggiari combination unit with motor, variator & flange mounted inline gearbox shown.